A pretty simple episode that illustrates why good guys are good guys and bad guys are bad guys. The Foot, led by Xever, take a hostage; the turtles try and take their own, but find out crossing the line is harder for them than they realized, which is why they are good guys. It’s the small gags that make this episode; Michelangelo wants a tattoo (and we have a surprise guest appearance by original cartoon Mikey), Donatello speculates on their original species (I’m voting for box turtle) and April pretends to go 21 Jump Street. After two warm-up episodes, Shredder finally gets around to doing all that entering the DVD box promised. 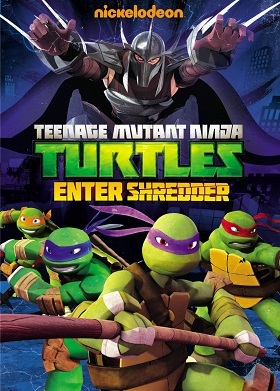 To his credit, he makes quite an entrance; the turtles are feeling confident after taking out the Kraang, Bradford and Xever all in one episode, when Shredder shows up like the final boss in a video game. Pretty action packed episode. Features three new mutants; Pete the pigeon, who is basically forgotten after introducing the storyline for the episode, and Bradford and Xever’s new forms as Dogpound and Fishface. After the turtles’ encounter with the Shredder, Splinter has nightmares about future encounters, so he keeps the turtles in the sewers. Unfortunately, Shredder comes up with a plan that doesn’t require him to actually know exactly where in the sewers the turtles are to take them out. Fortunately, April the spy is on the case, and they have water balloons and go karts to help them out. An episode about fear where silliness is the best defense. The Purple Dragons steal April’s cell phone. When the turtles try to recover it, they are interrupted by Baxter Stockman’s M.O.U.S.E.R.S. (little raptor like robots that make kitty noises) stealing from the Purple Dragons in turn. This all winds up leading Stockman to becoming the Shredder’s newest henchman, as well as Mikey and Donatello learning that Raphael and Leonardo consider them the B-team. We take a breather from Shredder and the Foot to see what the Kraang are up to; turns out they are fighting a giant alligator mutant soon to be named Leatherhead for a power cell that allows them to travel between dimensions. The turtles run into one of the many battles of this war, and Mikey comes to the aid of the giant alligator monster. Turns out this was a good idea, as Leatherhead is one of the nobler characters in the series, but, on the other hand, he’s also got really bad anger issues. Hulk level anger issues (which allows Splinter to be a completely awesome in one scene). Here’s another episode of the “Leonardo temporarily benches one of his brothers until they learn a lesson” vein. This time, the turtle Leonardo benches is … Leonardo. He’s sick of the responsibility. Plus, he’s met another new for the series but old for the franchise character, Karai, and decided Donatello and April don’t need a monopoly on this series’ human/turtle romantic tension. Oh, and Snakeweed appears, to fulfill the obligatory amount of horror tropes this series seems to love invoking. For this DVD, we have one making of animatic for the episode “New Girl in Town” and two chapters of a comic book story that I will eat my hat if I don’t see the twist coming from a mile away. Also, no sing alongs or coloring pages, like in the My Little Pony: Friendship is Magic DVDs … d’oh!